Whatever your plans are in terms of leisure or serious biking you will definitely need a helmet, maybe a jersey and a rain jacket. 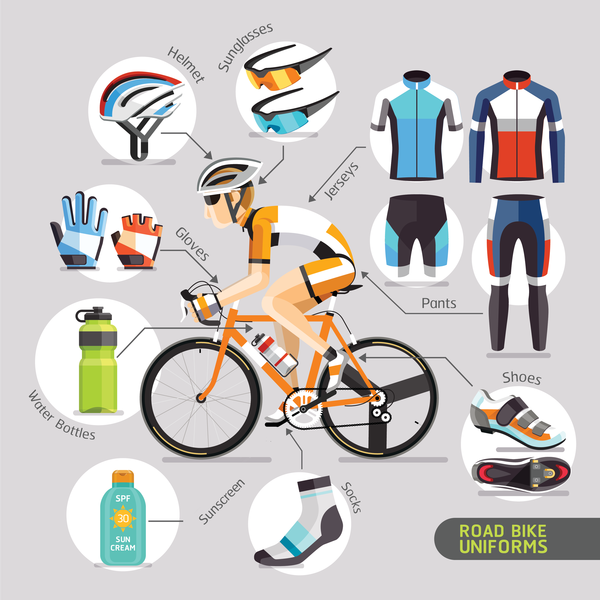 If you are planning on tackling a few kilometres you will need to take things a little more seriously and take a close look at pedals, shoes and accessories. Without going into too much detail, footwear and pedals are a whole new world. For now, you just have to decide if you want to be clipped in (securely attached to your pedals), or just have a normal flat pedal to build your confidence on your bike before making a move to the clipped in versions. The big advantage to being clipped in is the increased power you can push down onto your bike. For me, once you have been clipped in you will never go back to normal pedals but, again, this depends on what you want from your cycling. Like saddles, shoes are a very personal item, your fitter will measure the length and width of your feet to find the best shoe for you. Again it’s good to try some different brands as a nice, comfortable shoe is priceless once you start on your longer rides. If you just want to use the normal pedals you really do not need to worry about shoes, but if you have gone full on with clipped-in shoes and pedals, practice unclipping your feet from the pedals a number of times before your first outing. The last thing you want is to come to a junction or some traffic lights and not be able to take your feet off! I have fallen off my bike in front of a long line of traffic with people looking at me as if to say “why didn’t he just take his foot off the pedal”? If this happens to you, be advised, just pick yourself up, do not make eye contact and ride off as if it’s the most normal thing to do in the world, then let the embarrassment subside in the knowledge that pretty much every cyclist in the world has done it! Hydration is really important if you are going to be heading out for a good ride, so a water bottle (bidon) that you can carry on your bike is essential. Most frames have two bidon carriers, so treat yourself to a couple, they are normally no more than six euros each. The next important bit of kit is a spare inner tube, a pump, and some tyre levers just in case you suffer a puncture. You can put all of this in a small saddle bag that secures under your saddle, again your bike shop will have these, and if you have any worries about changing inner tubes, a quick visit to an online video site can give you all the help you need. The only other advice I would give you before hitting the open roads or trails is to always have a phone with you, some emergency money and a bite to eat, cycling is hungry work and nutrition is really important to fuel your ride. I never leave home without a banana or energy bar stuffed in my jersey pocket. Now you are ready to ride you will be happy to know that, in my opinion, you have chosen one of the best regions to cycle in France. It is no accident that the Tour de France has passed through twice in recent years. I can go out for a ride with my club on a weekend for a hundred kilometre ride and only see a handful of cars! There is also every kind of terrain you could wish for. So if you are looking for a nice flat ride with a coffee stop it’s here, if you want a real training ride with some brutal climbs, it’s here. If you do want to take up cycling a little more seriously, joining a club is a fantastic way to improve your riding and, along the way, meet new people from your local community. Nearly every small town has its own cycling club which can offer club rides for any standard, right up to racing throughout the region. One great ride for scenery is the Canal de Garonne. You can ride from the beautiful city of Bordeaux along cycle paths through vineyards to Sauveterre-de-Guyenne, then ride some quiet roads to join the Canal Du Midi. It is possible to ride along the canal almost all the way to Toulouse, with plenty of opportunities to stop for a spot of lunch or even a bed and breakfast along the way. Oh yes, and one final thing, take a map! Even if you are following one of the many cycling routes available, you might want to make a detour and, if you do, you will be sure to need that map to find your way home. Have fun, keep safe and enjoy! www.francevelotourisme.com is the ideal site to find your cycling route. It includes the Lot Valley Cycle Route, Canal des Deux Mers, EV3 – des Pelerins and more. Of course, you don’t have to do the whole route if you don’t want to. www.freewheelingfrance.com includes a handy list of English /French cycling terms with everything from a cog and frame to a spoke. A comprehensive list of cycling holidays, bicycle hire and cycling shops throughout Gironde, Dordogne, Lot et Garonne, Lot, Gers, Tarn et Garonne and north Haute Garonne can be found in our business directory pages under Sports and Recreation and Vehicles and Cycling.